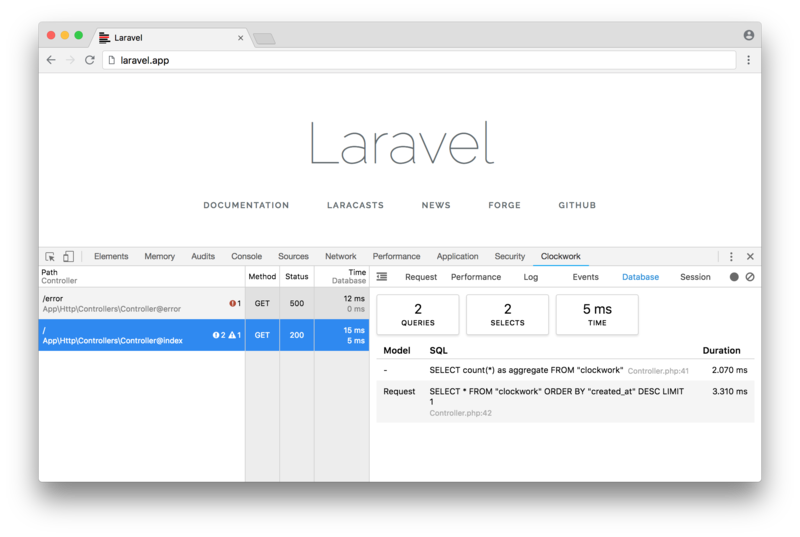 Clockwork gives you an insight into your PHP application runtime, including request data, application log, database queries, cache usage, execution visualisation and much more. Clockwork provides a Chrome or Firefox extension, or a web UI and a server-side component for gathering data that easily integrates with any PHP project, including out-of-the-box support for major frameworks. Try it out! This very website is Clockwork-enabled, check out the web UI, or download the Chrome or Firefox extension before using it your own applications. Clockwork provides integrations for Laravel, Lumen, Symfony and Slim framework. Laravel is the baseline, most mature integration, some of the other integrations might not support all features. Please see the table below for overview of the provided integrations. While providing a convenient integrations for popular frameworks, Clockwork is written in an extensible way and can be used with any other or custom framework or even in vanilla PHP applications. Please select your desired integration on top-right to see relevant information and examples for your use-case.